It’s Not All on the Hill in Washington DC – When you think of Washington DC you think of the White House or Capitol Hill, or the Lincoln Memorial, or the Bush/Clinton legacies, or the Obama administration or the vast number of museums which represent the United States of America’ s history. Rarely do we think of hitting this interesting spot to tie in a bit of shopping too. Well, rethink your next trip to the States and feel that you will not only leave the place with fuller minds but also fuller shopping bags! Washington DC has a number of great spots for shopping. Throughout the city you will find a good blend of the American chain-store favourites such as Barnes and Noble, Gap, Old Navy, etc. and unique spots for shopping. Georgetown is a popular Washington DC area for shopping, dining and nightlife. This place appeals to the younger ones but has plenty of boutiques and antique stores for all ages. Most of the shops in Georgetown are centred along M Street and Wisconsin Avenue. Dupont Circle is a lively hub in Washington DC and it has an eclectic selection of bookstores, clothing boutiques, art galleries, gift shops and coffee shops. A few blocks away, along Connecticut Avenue, you’ll find more traditional clothing shops such as Brooks Brothers, Talbots, Burberry’s and the Gap. Penn Quarter is a revitalized spot in downtown Washington DC and is bustling with activity amongst the new museums, contemporary restaurants and trendy shops. 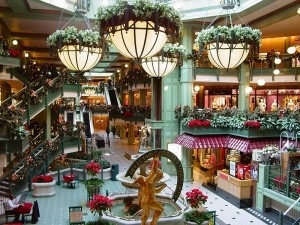 Some of the better known retailers include H&M, Pottery Barn, Ann Taylor Loft, Urban Outfitters, and Bed Bath & Beyond. Gallery Place is a popular venue for shopping, movies and restaurants. 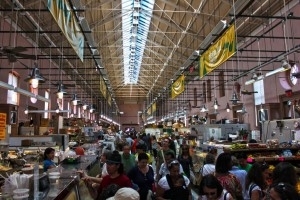 The Eastern Market, on Capitol Hill, is a Washington DC institution. It is a farmers market that offers fresh produce and flowers, delicatessen, baked goods, meat, fish, poultry, cheese and dairy products. On Saturdays there’s an arts and crafts fair and on Sundays a flea market features antiques, arts, collectibles, crafts and imported goods. Also on Capitol Hill, you’ll find lots of upscale shopping at Union Station, the city’s train station and a shopping mall with more than 130 stores, several restaurants and a 9-screen movie theatre. So why not fly direct to DC, get a bit of culture in whilst shopping up a storm in one of the many popular spots and grabbing a bite to eat at the Framers Market or in one of the ultra trendy eateries in Georgetown or Penn Quarter.